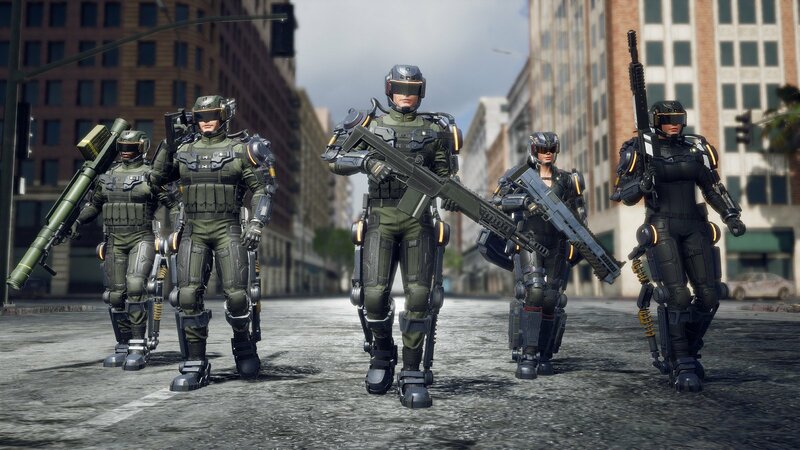 We've officially reached the point where EDF games are not only consistently released in the west, but get a simultaneous worldwide release, starting with Earth Defense Force: Iron Rain. 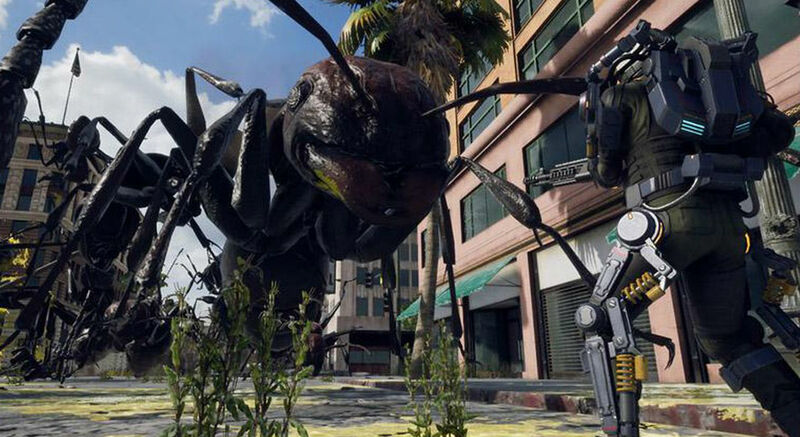 As it turns out blasting giant bugs isn't just something one region enjoys: it's a universal truth. Iron Rain opts for a slightly more dire narrative and wholly benefits from it. As the last survivor of a complete and total annihilation of most of the Earth's elite anti-alien forces, it's your job to rise from the ashes of defeat and use your energy core-fed superpowers to take down the extraterrestrial threat. Or something like that...you're still blasting giant acid ants at the end of the day. There's a good amount of B-level cheese involving a seven-year coma and you waking up as "the hero," a ton of kaiju to topple, and even alien bug robots. The day-to-day of this arcade-action romp is listening to that satisfying crunch of blowing up bugs. The third-person scheme still works, especially with more freedom of movement and a mostly stable engine...mostly. Using a PS4 Pro, I found the framerate to be consistent, but it has the tendency to crawl when there's a ton of stuff on-screen. No, EDF is not completely jank-free (still), but it nearly always nails that simplistic arcade-like feel. Yet, there's some nuance to Iron Rain to propel it past the point of mindless shooting. Enemies get a little tougher around mission 15 or so, and can either overwhelm you or chunk massive portions of your health. Equipment options like "a rifle that gets more accurate the more you empty its clip" are fun enough to create some decent tense moments where you need to actually somewhat think; same thing for the weapons that feature Gears of War-esque active reload options. There's a large swath of build variety to the point where practically anyone can find something they jibe with. If you want to fly around and use a laser cannon with finite ammo that runs out eventually and an infinite ammo rocket launcher: sure. If you prefer to remain grounded and want to snipe things from afar, you can do that too. Pretty much everything is viable: throttling the jetpack to avoid overheating as the Jet Lifter class is natural, as is utilizing the multiple dashes of the standard Trooper (soldier) archetype. Item management is also super easy with a huge bag of tricks you can swap between with the d-pad. It's the biggest strength of EDF and something that constantly powers you through some of the weaker arenas and the aforementioned jank. 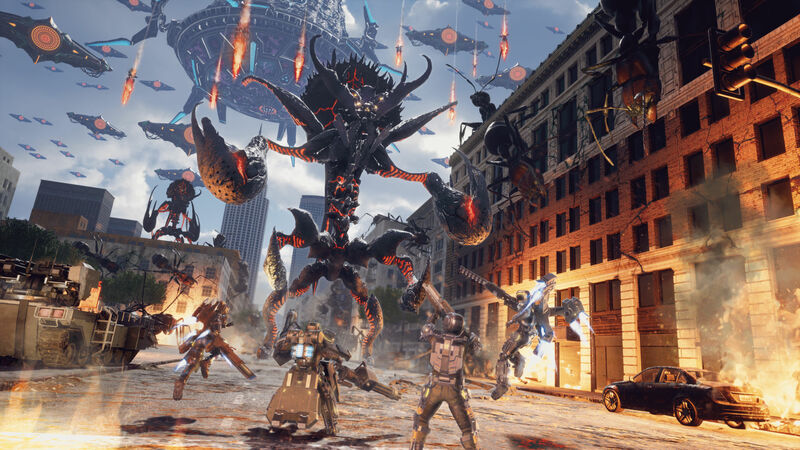 For all you folks that have EDF groups: solo, split-screen (for two), and online (which includes a 4v4 PVP "mercenary" gametype) modes of play are all supported. Although I wasn't able to fully test out the latter, split-screen (with jank, especially around mission 20 onward) works, which helps as the AI is still as dumb as rocks. Whether you go at it with a friend or by yourself, for the most part missions do deliver. Many maps are constant action-fests, even if a few feel lifeless and less detailed (usually the abandoned desert cityscapes). The endgame is dominantly just blowing up everything in sight, but I appreciate when a unique stage rolls along that features an unbeatable force or pops in last-minute unseen (and sometimes, non-alien) threats.